On behalf of the Calamares team and Blue Systems, I am proud to announce the immediate availability of Calamares 1.0. Calamares is a distribution independent installer framework. I had the initial idea for Calamares in May 2014, less than a year ago, and out of frustration: many successful independent Linux distributions came with lackluster installers, and all of these installers were a result of competition rather than cooperation. Improving one of the existing installers wouldn’t have fixed this, as every installer was more or less distribution specific. I wanted to create a product that would satisfy the requirements of most Linux distributions, developed as an upstream project for all of them. With support from Blue Systems and some help from Aurélien Gâteau I started from scratch around June 2014, with a highly modular design and some valuable contributions from KaOS, Manjaro, Maui and Netrunner developers. Contributors from Fedora, BBQLinux, OpenMandriva and the KDE Visual Design Group joined in afterwards. Now, a little over half a year of design and development frenzy later, we choose to call it 1.0. While there is still room for improvement, we have decided that the first development iteration is done, and we are presenting a modest yet feature-complete product. Calamares is built with Qt 5, C++11, Boost.Python, (bits of) KDE Frameworks 5 and KDE Partition Manager. 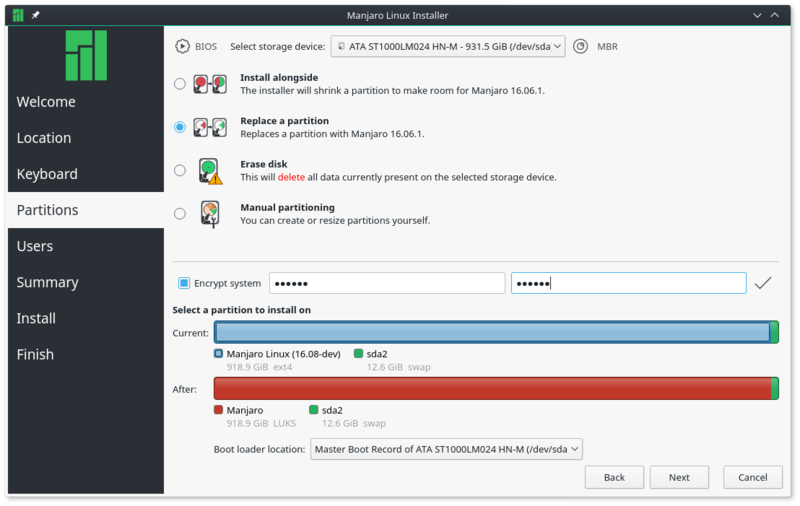 an advanced partitioning tool, with automation and resize functionality and both DOS and GPT partition table support. The Calamares team hangs out in #calamares on Freenode, feel free to drop by. Bugs should be reported to our issue tracker, and pull requests go to GitHub.